An article in "Times Live" published earlier this year delivered the exciting news that Britain's Prince Harry has been appointed as African Parks’ new president. He has long been an advocate for many just social causes, wildlife conservation chief among them. He joins his brother Prince William who is working to ensure the survival of elephants through the Tusk Trust among other wildlife initiatives. You can read the article below and watch a fascinating video detailing his work with the organization at the bottom of this page. In an interview broadcast in the UK today‚ Prince Harry expressed his support for various environmental causes‚ saying: "Coming from a younger generation it is incredibly exciting and I feel optimistic about the future because now is a real test for‚ a real test for humanity to be able to swing that pendulum and say right in order for us to make our mark on this planet." His father the Prince of Wales said: "We have somehow abandoned our proper connection with nature. Somehow imagined that we can manage without or we battle against her in every way instead of understanding that the future lies in working in far greater harmony with nature." African Parks is a conservation NGO‚ founded in 2000‚ that manages national parks and protected areas on behalf of governments and in collaboration with local communities across Africa. With 13 parks under management‚ they say they have the largest area under conservation for any one NGO on the African continent. “We are extremely honoured to have Prince Harry officially join African Parks as our President‚” Peter Fearnhead‚ CEO of African Parks‚ said on Wednesday. 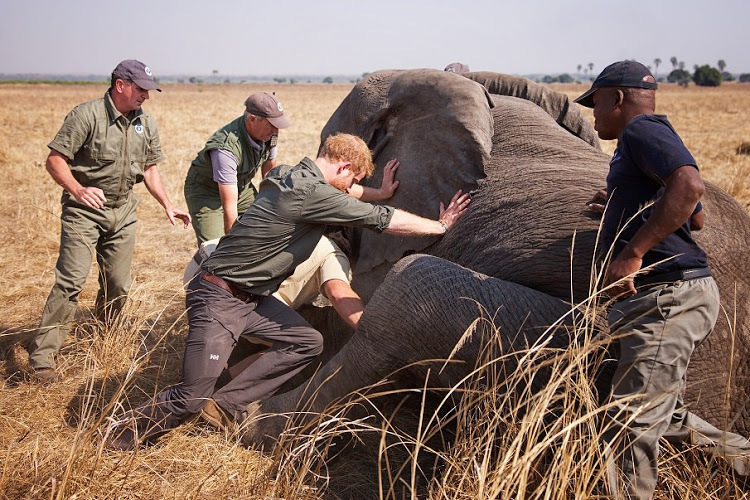 Prince Harry’s first experience working alongside African Parks was in July 2016 in Malawi‚ where he served as an integral member of their team‚ carrying out one of the largest elephant translocations in history. Along with moving elephants to a new home‚ Prince Harry assisted with translocating a rhinoceros‚ a host of game species including antelope‚ buffalo‚ and zebra‚ and he facilitated in re-collaring three lions with GPS collars to help better protect them. The organization said in a statement that together with Fearnhead‚ he also met with Malawi’s President Peter Mutharika to discuss the Presidents’ conservation vision for the country‚ as well as the work of African Parks‚ who manages three parks in Malawi and is responsible for protecting 90% of the country’s elephant population.